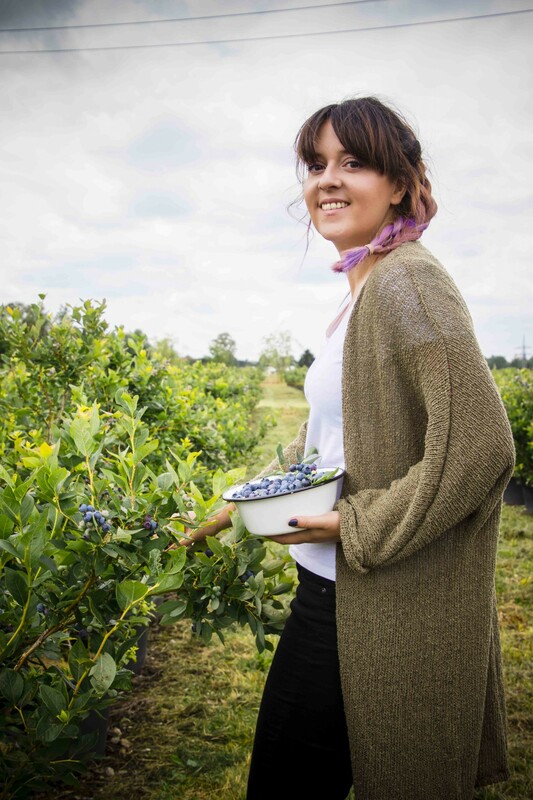 As usual in the blog seasonal recipes, and what else could be now? 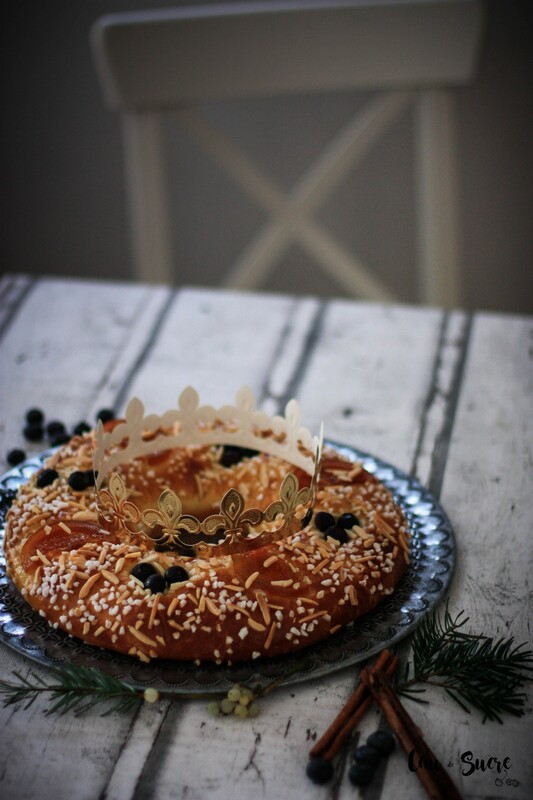 A “Roscón de Reyes”! 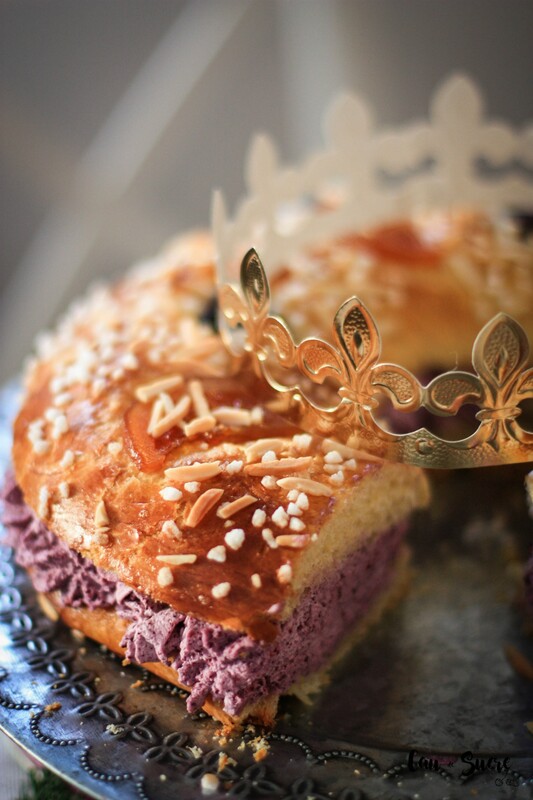 Easy recipe of the “Roscón de Reyes”, quick and without using sourdough, in a morning you have it done! And the brioche will be super spongy. 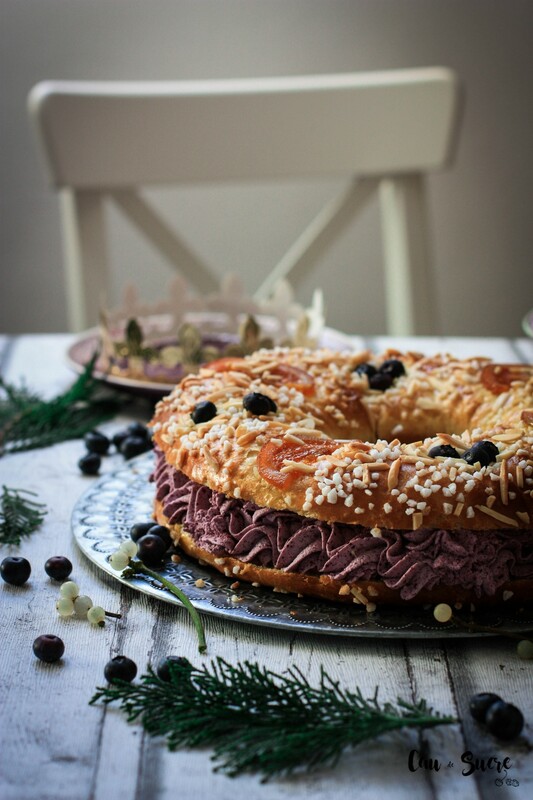 Also, the cool thing of this “roscón” is in its delicious stuffed cream of blueberries, as simple as whipping cream with several tablespoons of lyophilized Blueberry powder. I’m back here after my holiday break (very well deserved, by the way). I come back just for the dates that everyone looking for a recipe for this traditional delicacy eaten in Spain on January the 6th. For those who do not know it, in Spain on January the 6th it is officially the last day of Christmas. In addition, it is a very special day because it is the day when the 3 Kings bring presents to the children. 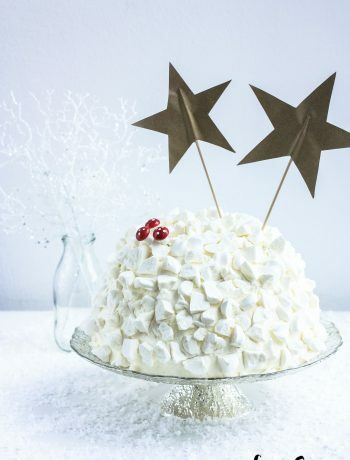 And is always celebrated with the last family lunch of the season in which this type of sweet is served as dessert. Well, the goal of today is take away the doubts and convince you to do it at home. Sure, I know what you are thinking, of course you have experience baking, for you it is easy. But look, I am telling you something, it is the second brioche dough that I do in all my life. Yesterday I spent the day biting me the nails, looking at the dough every 5 minutes to check if it was OK, and until I didn’t took the first “roscón” of oven I was not relaxed because I also had much fear of failure. And the truth is, there was no reason for! Because indeed it was super easy. You just need find the proper recipe and be very patient with the fermentation times. And don’t let people mess you up with complicated recipes using sourdough, this is used by bakers to save yeast basically, although there will be somebody telling you that it is more natural, or even tastes better. I really don’t think so. To make a “roscón” at home all these stories don’t make sense, you put quite a lot of commercial yeast and that’s it. It can be done in a morning and only with 2 fermentation, one long and another shorter. In the recipe I will explain the trick to speed up the fermentation process. Another thing that worries you is kneading. If you have a Kneader, perfect, if don’t handmade knead works perfectly. And what about the ingredients, are the most normal thing in the world, also accept a lot of variations for decoration and filling, so fits all tastes very easily. I think I have already convinced you. Remember: seek easy recipes and be patient, that is what you need (well, and lots of love, as always). 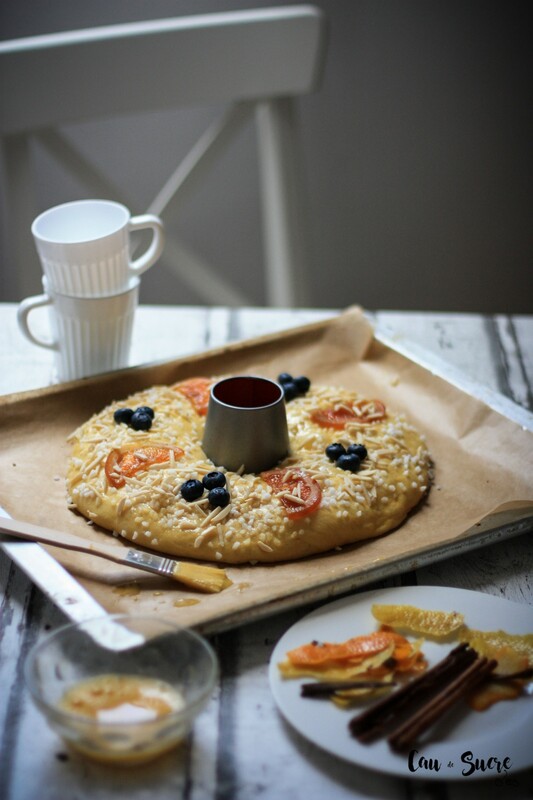 By the way, read the post until the end because I am leaving you a recipe of stuffed bonus much more traditional that I did with the two small “roscón” siblings that came out of this dough. I wish the 3 Kings bring you a lot of presents!! In a large bowl, or in the bowl of the kneader if you have one, mix the flour, with the sugar, salt and fresh yeast crumbled. Heat the milk with cinnamon and citrus skins in a saucepan. When boiling, remove from the heat and cover the saucepan for 10 minutes to infuse and mix. This step is optional, it will give the roscón a better flavor, but if you do not want to do it, simply use some warm milk. Strain the milk and pour in the bowl of the dry ingredients. Then it incorporates the water of orange blossom, the eggs and the orange zest. Knead (by hand or with the hook attachment of the kneader) until you get a smooth dough, at least 2 minutes kneading. At this point, incorporate the butter little by little, into cubes and see kneading to integrate. If the kneader has trouble, you can do it by hand. Keep kneading until you have some elastic dough and a bit sticky. Make ball with the dough and put it in another bowl clean with the base covered with flour. Cover the bowl with a towel and let the dough ferment for about 2 hours. The ball has to triple its size. Here the trick so that the mass ferments faster, you can put the bowl in the oven to about 35-40º C, with the heat the process accelerates. When it has fermented, knead again lightly on a surface covered with flour and it is time to make the roscón. From this amount of mass you will get 2 medium or 1 very large. I made 1 medium and 2 small to give, you just have to divide the dough into the parts you want. To shape it, make a ball and flatten it a little, with your fingers make a hole in half and stretch the circle so that the hole opens. Put some object in the center to make sure it does not close, with the fermentation grows a lot and can be closed. 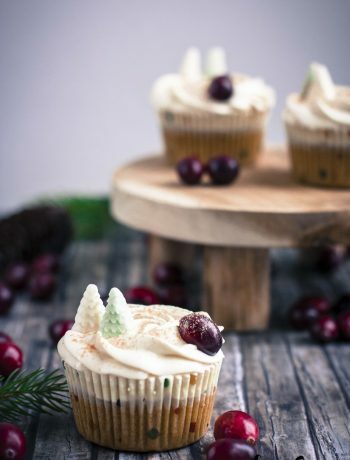 If you are not going to put stuffing, now is the time to hide the surprises inside the dough. Place on baking paper and cover again with a rag. The second fermentation will be between 30 minutes and 1 hour, depending on the weather. You can use the oven trick again. The dough should double its size. Once fermented, preheat the oven to 170ºC. 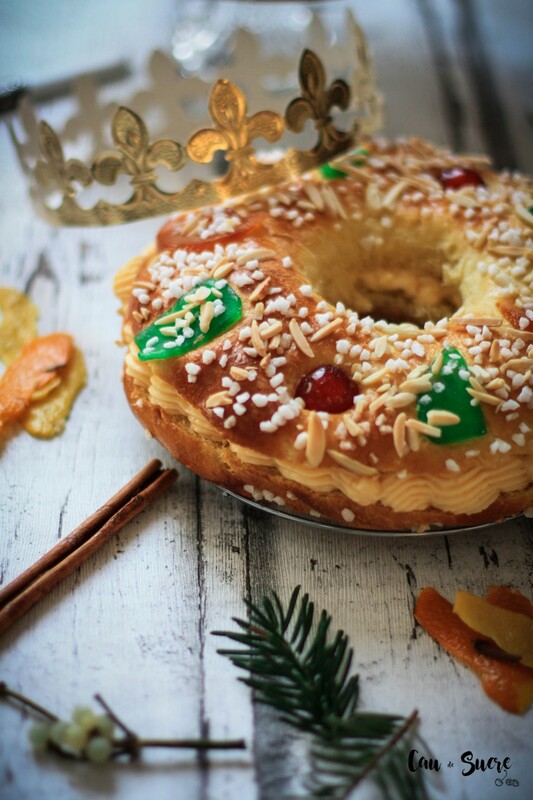 Paint the roscón with egg, and decorate to the taste with pearly sugar, almonds and candied fruit, or anything else that you like. Bake for about 15-20 minutes, or until golden. ATTENTION!! I want you to stick to the oven! This has to be monitored because in the last few minutes it gets golden very fast and 2 or 3 minutes more we can burn. Remove from oven and allow to cool completely. While you can prepare the filling. Put the cream, which must be very cold, beating at high speed for about 2 minutes. When it is almost done, add the sugar and stabilize it and beat it a little more. 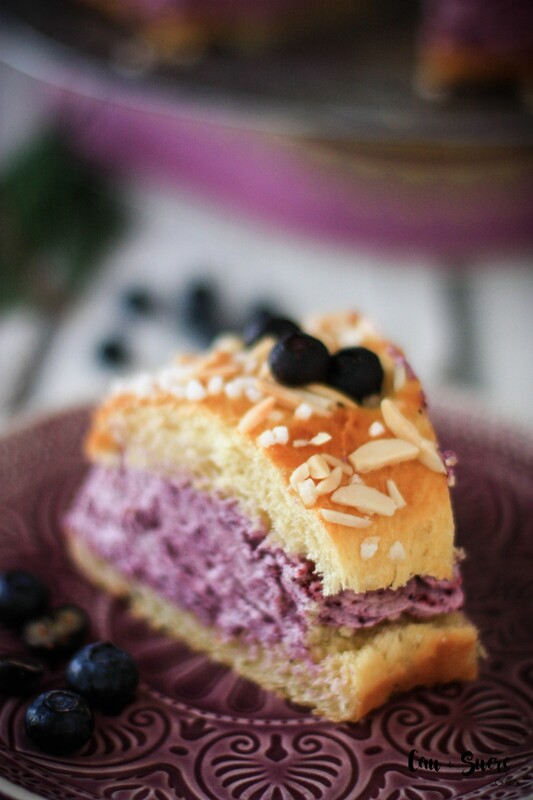 When fully assembled, add the spoonfuls of blueberry powder and beat until the color is homogeneous. Let the cream rest in the refrigerator for 20 to 30 minutes, this will cause it to take more body, the stabilizer acts and that hangs more time. Fill a pastry sleeve with the cream. 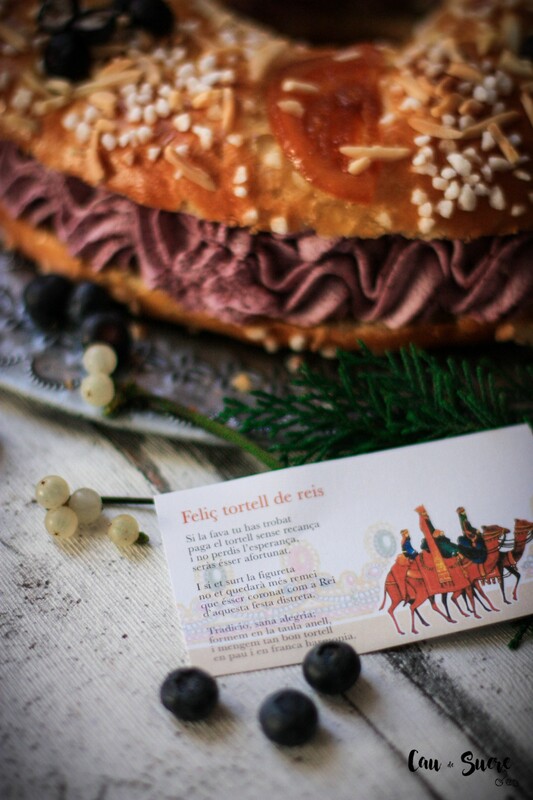 Open the roscón in half, very carefully that it will not break, stuffed with the cream and, enjoy! Uh, you reached the end! As promised, here is the photo and the recipe for the alternative filling I made for the other two “mini-roscones”. I stuffed them with Catalan Cream (similar to Crème anglaise), but very thick and suitable for this kind of pastry filling. Bring to a boil the milk with the cinnamon and citrus peel. In a bowl, mix the egg yolks with the sugar and the cornstarch. When the milk is boiling, remove from the fire and strain. Pour just a little milk in the bowl of yolks (if too much then they cook) and mix with a whisk until incorporated. Continue slowly pouring milk and do not forget to remove. Put it back into the fire in a pot mixture and stir continuously, heat until it begins to boil. Remov from the fire and let cool completely with the surface covered with a transparent film to make no crust. When the mixture is cold, fill a pastry bag and use to stuff the “roscón”. If not you’re going to eat on the same day, you have to keep in the fridge. Hola Raquel! Estoy haciendo esta deliciosa receta una semana tarde, pero todo proyecta muy bien. Gracias por compartirla. 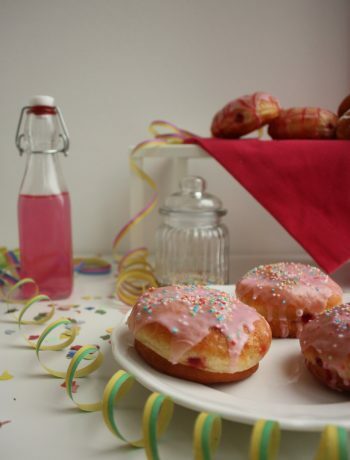 Honestamente los roscones tradicionales son un poco feillos pero esta receta los hace lucir espectaculares. 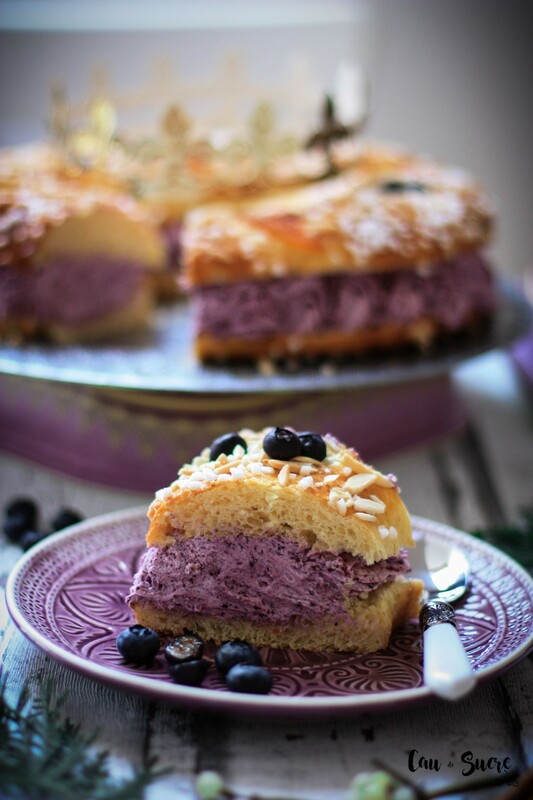 Gracias a ti por hacer mi receta y por tu comentario! Espero que te haya gustado!! Curioso que la hagas una semana tarde, pero la verdad que cualquier momento es bueno para comer roscón.